Enjoy a lovely lunch at the contemporary see-through bistro offering unique views of the Eiffel Tower and the River Seine. After your lunch, you can enjoy a sightseeing cruise. Treat yourself to an amazing lunch at the beautiful Bistro Parisien, enjoy the view of the Eiffel Tower while you eat and follow your lunch with a scenic cruise on the River Seine. Choose between a starter + main course or a main course + dessert. 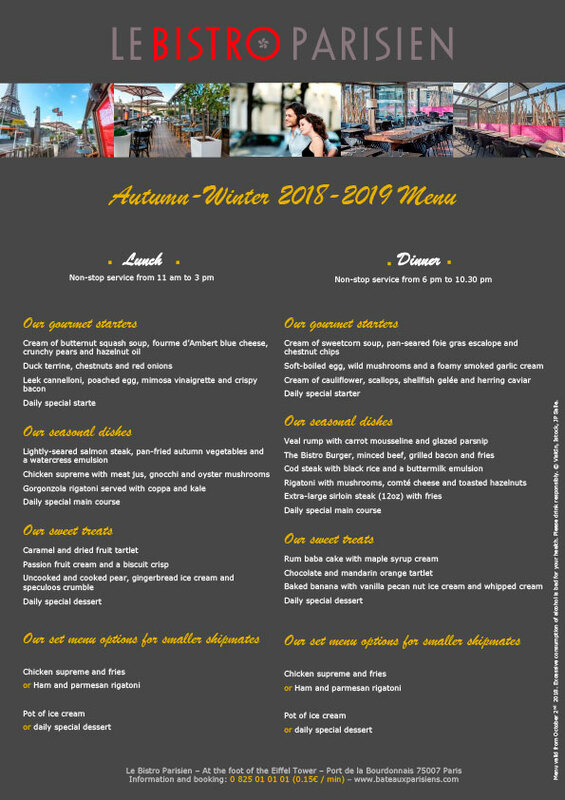 The chef uses seasonal produce to prepare tasty and authentic cuisine for your enjoyment. You can choose to book your lunch at Bistro Parisien with or without the sightseeing cruise. Where is Bistro Parisien located? Bistro Parisien is located at the foot of the Eiffel Tower. The address will be provided on your e-ticket. You can see the lunch menu here. 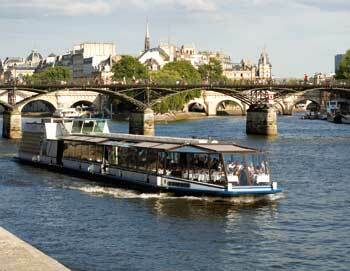 The cruise starts at Bateaux Parisiens at the foot of the Eiffel Tower. The cruise lasts 1 hour. Where does the cruise go? You can see a map of the cruise route here. Yes, children's tickets are available for children between age 3-12. Children under age 3 are free when accompanied by a paying adult. Lunch is served between 11 AM to 3 PM. The sightseeing cruises run between 10 AM to 10:30 PM.